Well, semi- famous, I got mentioned in the SF Chronical’s SF Gate. I had a show 2 weeks ago with support of Urban Solutions, San Francisco Arts Commision and 2 Blocks of Art. It was fantastic show, I sold 3 paintings, did 2 interviews, got invited to a friend’s Open Studio in December and made some dough. I couldn’t have asked for more. My last two months have been so busy with shows that I haven’t had time to do anything but paint and prepare for upcoming shows. 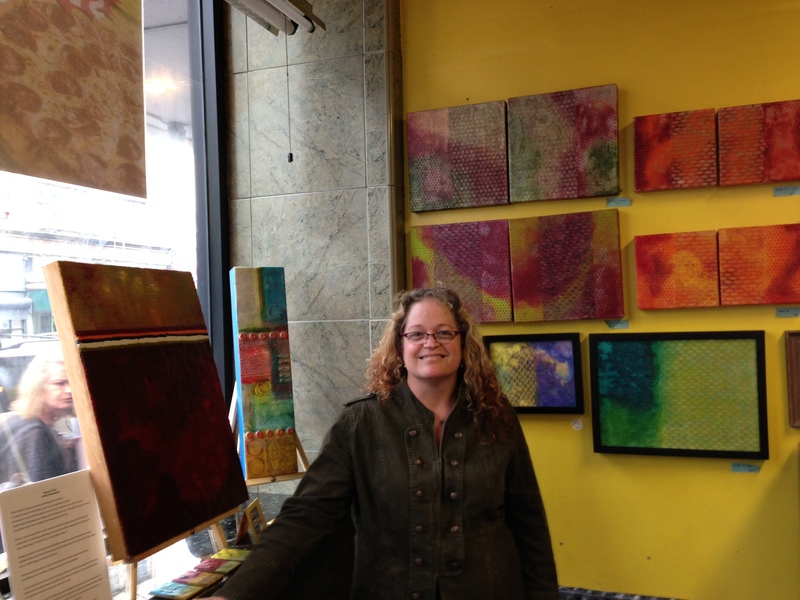 I have sold a lot of work….yay me…..had a few live interviews and really felt like an artist. I will be working for the next two months for another Open Studio that I was invited to participate. I am so thrilled at how these past few months have turned out that I know I traveling in the right direction. I will be sharing my new larger work on this blog in the next few weeks. I have decided that my work is too small. I need to increase the size so I bought boards that are the largest I have ever worked on and have started 2 of them and feel so great about it. They are 24″ x 24″ and 24″ x 48″….. I can’t wait to share them with you. One of the new techniques I have been working on is how to get the most texture I can out of the hot wax. I have been trying to put art materials together that don’t normally “go together” and using them to benefit me and what my vision is. I will be sharing with you some samples coming soon. If you would like to see what else I have been up to please visit my etsy store. The picture below is from my last show.